I am not a Freemason. I therefore speak to you with respect and gratitude from outside. I habitually answer those who are critical of Freemasons that, as a rule, we should judge every organization by the best we find in it, and not the worst. The best defense of the Masonic tradition is the people whom I have known, loved and respected, who have been Freemasons. They number, for example, an uncle, my loved parish priest, Bishop Edmund Sara, Dean Peter Moore of St Albans, who has just died, among many others. You cherish long and intricate pedigrees to very ancient foundations in human civilization. The real history of your movement, where it emerges as an important force in British life, strikes me is magnificently 18th century, the age of common humanity and the Rights of Man. The sort of people who came together to found Lodges were typically middling people. Oliver Goldsmith remarked in the middle of the century that there were so many middling people, neither very grand nor very humble, while on the continent the classes were too polarized. That some Lodges are very grand indeed does not undermine the fact. The freedom to associate, to combine for the purposes of Lodge activities and charitable purposes, was one of the symptoms of social health in 18th century Suffolk and one of the means whereby the country was maintained in peace. Private faces in public places are wiser and nicer Than public faces in private places Then again, the Lodges of 18th century England were godly without being sectarian. The importance of that can hardly be exaggerated. 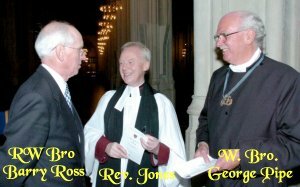 When we consider the violence of religious quarrel in the 17th century, the century of the Civil War and the struggle of the religious sects, it is amazing that in the Masonic Lodges, dissenter and Church of England men sat down and were brothers together. What was the secret? It was that in all classes of society, people were coming to believe in common humanity, mankind. They were moved by what people had in common rather than in what history had brought to pass. Now, the idea of human rights and human dignity have become a cliché, so that we forget what a new idea this was in 1730. But it was in England, influenced by the writings of John Locke, that men and women first felt their liberties and civil decency were no more and no less than merely human. By our standards their world was unbelievably coarse and class-ridden, but the founding of Masonic Lodges was a means whereby they showed how moved they were by these new ideas and ideals. They insisted on good behavior. If any Brother Curses, Swears or says anything Irreligious, Obscene or Ludicrous, Holds private Committees, Disputes about Religion or Politics, offers to lay Wagers, or is disguised in Liquor during the Lodge hours such offending Brother shall be immediately fined by a private Ballot for each offence … each fine not to be under one shilling nor to exceed Five Shillings.